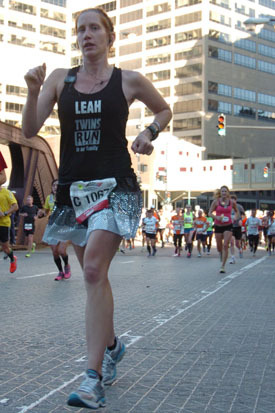 I'll miss you personalized TWINS RUN shirt! In the 2-3 weeks before the 2013 Chicago Marathon, as I continually weather stalked the forecast, I decided that if temperatures weren’t comparable to the near-perfect conditions that lead to my PR last year (3:36:35, 38 degrees at the start, 46 at the finish), I would completely scratch out my A/B goals (A goal = 3:35, -5 min BQ; B goal = 3:36:34 PR). My revised C goal would be to BQ by at least -1:38 (3:43:22), the time needed to gain entry into the 2014 Boston Marathon and a somewhat safe bet on a 2015 qualifying time. I admit that my confidence in running to my potential was seriously rattled after the 2013 Boston Marathon when I ran far short of my goal, yet persevered to a 3:53:07, only after contemplating just throwing in the towel and walking. The irony is that when I saw my goal of running 3:40 in Boston slip away by the 10 mile point, I rallied and changed my goal to running my 3rd fastest time (under 3:54:47) because I didn’t want to have a “bad memory” of the race. Little did I know at the time, that things would get much worse than not meeting a time goal. So after much deliberation, I decided that instead of running with the 3:35 pace group like I did last year, I would start out with the 3:40 group and hope I could hold on for the entire race. Knowing my history of running 20 marathons with a positive split (yes, only 1 of my 21 marathons, my 2nd, was a negative split! ), I had a feeling that I would probably do so again and thought that if I started at 3:40 pace, I could slow down 3:22 in the 2nd half and still meet my goal (or, worst case scenario, slow down 5 minutes and be a BQ squeaker). Last year I ran the 2nd half 3:35 slower (1:46:30 and 1:50:05). sparkle skirt from Rock City Skirts. The Boston Marathon was heavily on my mind during the entire trip. I wore my 2013 Boston Marathon jacket with pride and was happy to talk to anyone who stopped me on the street to share my story of the race. Before the walking to the starting line, my twin and I met with a reporter and were interviewed about our experiences as a runner and spectator at the 2013 Boston Marathon and how it affected our plans for the Chicago Marathon. As we made our way to the starting line, my twin and I posed for countless pre-race photos. However, only one was in the sunlight (and sadly, in that natural lighting shot, I was photobombed by a highway sigh). Darn the flash for uncovering every flaw in your complexion! We went out with the 3:40 pace group and after running behind them for 2-3 miles, I decided to go in front so I could just run my own pace and not freak out that I was only a few steps from losing them. This could have been a mistake since I did speed up slightly from the goal pace of 8:24 (my first four 5K splits were 8:18, 8:18, 8:22, 8:21). During the 30K, the pace group that I had been ahead of for the entire race, finally passed me. I started to freak out a bit. I knew that last 5K was considerably slower (8:35 pace) and if I wanted to reach my goal, I’d have to push it into a new gear instead of continuing to slow down. At this point, my tank top was already on the side of the road (I ditched that around mile 13), and I decided to double up on pouring water on my head. This really helped and I was able to run the next 5K faster (8:28 pace). With 6 miles to go, I reached the bargaining and math stage – if you just run one more mile at this pace, you can slow down for the rest of the race and still reach your goal. Uh oh. My MP3 player isn't working! Then with three miles to go disaster struck, my MP3 player froze and I no longer had my power songs to push me through. Thank goodness the crowd support was so intense, it kept me going (I only wish I would have had my shirt with my name on it so I could hear people call my name those last few miles!). When I hit the 40K point, I started to panic a bit. There seemed to be runners down with medics with even more frequency, others walking slowly in obvious pain. Even though I knew I could reach my goal if I ran a 10 minute mile pace, I couldn’t help but wonder what I would do if something new started hurting, or I stumbled over a runner who stopped suddenly in front of me. I was so cautious and focused at this point that I felt like I was clinging onto my goal for dear life. Seeing so many people on the ground or zombie-like with less than a mile to go really freaked me out. I don’t think I’ve ever been so nervous and scared during the last mile of a race. I had made it this far, the thought of being so close and not running a BQ was terrifying. I started feeling like I was going to throw up (something that never happened to me in a race) and my shoes were so soaked it was like running on sponges! I think that’s probably why my last mile, especially the last .2 mi was so slow, I didn’t dare risk “sprinting” to the end, for fear I’d pull something and then be on the ground too! Whoo hoo! I met my goal. PHEW! I think I was happier at the finish line this year, running 6 minutes slower, than I was in 2012 when I ran a PR. Last year, I was disappointed because I really wanted to run under 3:35 and I felt like I blew it the last 4.5 miles. This year, I could have easily given up during miles 16-18, but I focused and pushed through it. I still slowed down more than I wanted to, but I achieved my goal by almost a minute 3:42:23 (-2:37). I was grateful that we were forced to walk so long through the finish area because otherwise I might have ended up in a ball on the side of the road succumbing to the nauseous and cramping. As soon as I got to the Balboa Tent I went up to runner tracking to find out how my twin did. I was really hoping she had qualified too, but I lost touch with her around the ½ way point so I had no idea what happened. When I found out she ran 4:04, I knew she’d be just as sad as I was in 2011 when I was on pace for a BQ up until the half, but ended up finishing 4:07. I know my sister was disappointed and upset, but I also know she will qualify just like I did. This was just her first attempt at a BQ. I made about 4-5 serious attempts before I finally made it. I have complete confidence in her, because it’s genetic. If I can do it, so can she! 2. Practice postive self-talk and have a few mantras to get you through the last 6 miles. I kept thinking "BOSTON" and "EACH MILE IS A GIFT." 3. Listen to your body and make adjustments. I always drink gatorade and not water during marathons, but I felt like the gatorade was making me sick, so I stuck to bananas and water for the 2nd half of the race. 4. I'd rather run through a little discomfort than full-on fatigue! The first 6 miles I was quite aware of my hip and piriformis. I was definitely not running painfree, but I was able to manage it and still maintain my goal pace. It wasn't until the sun was blazing and I started feeling tired that the miles got tougher. 6. Don't always trust your Garmin, especially if you're in a city with lots of tall buildings! I hardly looked at my watch during the race because I knew it wouldn't be accurate. Luckily I only ran 26.37 miles, but I know others whose watches said they ran 27! One of the best things about a race that's large and part of the World Marathon Majors is that you get 5K splits (same with Boston). I LOVE DATA! It's so fun to compare accurate splits from year to year. 8. THANK THE VOLUNTEERS! I made sure to say thank you to every single person who handed me a cup of water (especially since I think I might have splashed a few as I poured the contents over my head!). I can't imagine standing out there for hours without getting some encouragement, especially since they aren't getting paid! So if you have the energy, don't forget to say "Thanks!" 9. Sometimes you get what you pay for and some times you don't, but if there's an "upgrade" option at a race, I usually take it! The Balboa Tent at the Chicago Marathon isn't cheap, but, for me, it's worth the money. A warm place to hang out before the race, easy bag drop, pre- and post-race food, and post-race massages are nice amenities to have. The Chicago Marathon isn't cheap to begin with, but it's a first class experience - from an amazingly organized packet pick-up, to free runner tracking, to an amazing race shirt and results book. The World Marathon Majors are top notch races and, if you can, I'd highly recommend attending at least one!